Epic fail Mother Nature and Delta Airlines! Atlanta is having one helluva week my friends! The fire on I85 last week and the fierce weather this week, thunderstorms, tornado warnings, crazy rain and even a possible earthquake. That being said, all of that wreaked havoc on travelers going to/ from/through Atlanta to today and I’m not sure how many days beyond! And it all started on Wednesday right here in Atlanta! Wednesday, I had trouble checking in for my Thursday flight, I thought it was a glitch with the app, then I had trouble on their website. Ok, I’ll deal with it when I get to the airport on Thursday. Thursday came and at 430, Delta cancelled my flight, ok, but aren’t you going to rebook me? Yup… leaving from Appleton, WI. Excuse me? Where is Appleton, WI?! I found out it’s about six hours from Chicago! Huh? Did they expect me to drive from Chicago to Appleton to then fly out? I tried calling Delta… three hour wait! What? No thanks! I’m still waiting for a call back from the morning! I called my travel company and after the 40 minute wait, I talked to a person, finally! EVERY and I do mean every flight , that includes EVERY airline, he tried to book me on filled up! “There’s a 9pm on United” “Great, book it!” “Oh, it’s gone”. As soon as he found one, gone. The final outcome, 554pm out of Midway Airport on Friday. I’ll take it! When I finally got to Atlanta tonight, Delta was still canceling flights! 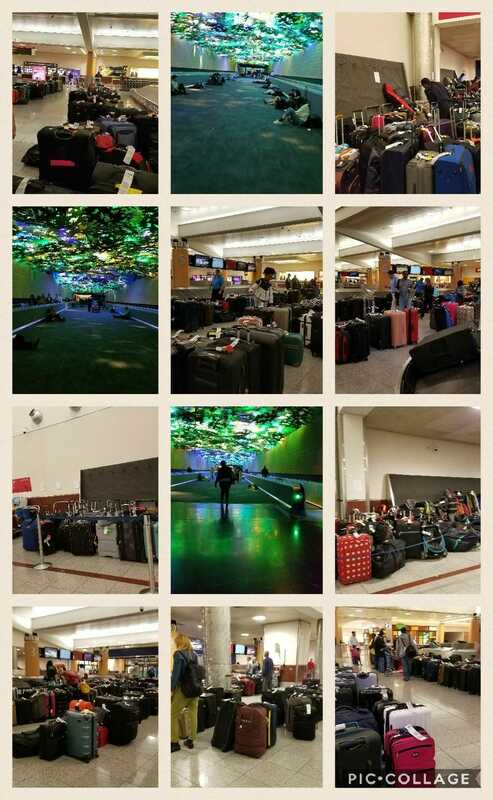 Take a look at the people sacked out between terminals! Some had blankets, some had food, at least there were outlets! I heard that Wednesday one of the flight attendant crews bought folks pizza, nice of them, still doesn’t help overall. And now look at all the luggage stuck between the carousels! These aren’t different angles of one or two carousels, these are just a few of what they have! Good luck Delta… You’re gonna need it!